Generally speaking, there is an inherent tension in the production of translations between cost and level of quality. The more time a translator spends on revising and polishing his/her text, the higher the quality of the final product. On the other hand, the more time spent on quality control, the greater the cost of producing the translation. In an age of increased global competition, large translation services are acutely aware of this dilemma and would eagerly welcome any way of resolving it, even partially. RALI has developed a new prototype of a system that can help reduce the cost of quality control by partially automating the job of translation revision. As its name implies, TransCheck is a tool that can assist a human reviser by detecting certain types of translation errors and by helping enforce bilingual standards across a large translation service. TransCheck is designed to verify the correspondences that obtain between a source text and a draft translation, and to ensure that they respect certain generally recognized properties of a good translation. This is what distinguishes a bi-textual tool like TransCheck from monolingual writing aids like a spelling or a grammar checker: because they only operate a single text, the latter are incapable of detecting translation errors, even of the most flagrant kind. In order to verify translational correspondences, TransCheck begins by aligning the sentences that make up the source text and the draft translation; and then it verifies that these pairs of aligned segments contain no prohibited correspondences and respect certain obligatory correspondences. Of course, this is something of a simplification, but basically this is how the system works. The job of translation revision is generally assigned to senior translators; these are highly paid specialists who possess a great deal of knowledge and technical expertise. There can be no question, therefore, of wholly replacing such experts with a computer program; indeed, determining and correcting all possible translation errors is probably a more difficult task than machine translation itself. On the other hand, a system which could save human revisers time and effort by relieving them of the more mindless and mechanical aspects of their work would most certainly be appreciated. In fact, translation managers have told us that they would eagerly welcome a system that could automatically detect just the most glaring of translation errors; for every translation service must on occasion send out a text that has not undergone a thorough human revision. 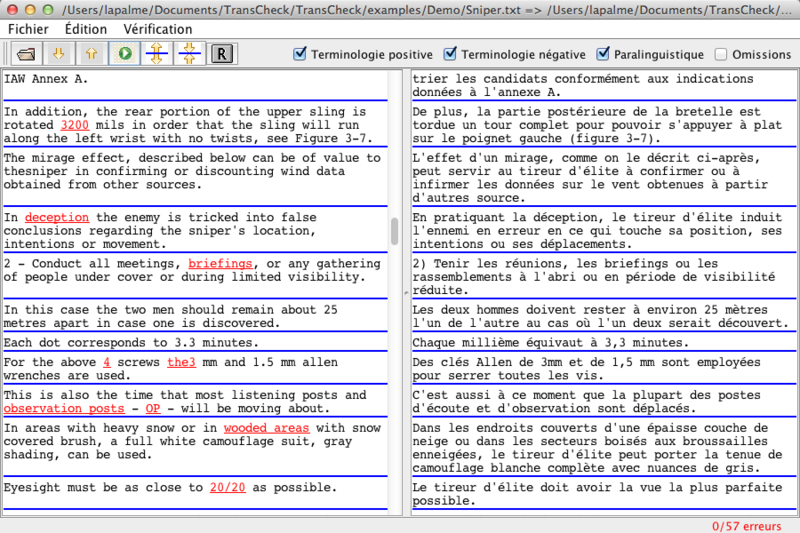 Positive terminology: the system checks if some terms are translated by one of their allowed translations, this list can be customized for each application or text. Negative terminology: using an anti-dictionary of prohibited correspondences, TransCheck flags dubious translations such as false cognates (e.g. "library" and "librairie"), calques (e.g. "certificat de naissance") and illicit borrowings (e.g. "booter" as a French verb). Numerical expressions: The incorrect transcription of a numerical expression, a part number, a date or a sum of money is another type of embarrassing error that TransCheck can detect. Revising a text that is full of numerical expressions is a particularly stultifying task. Each numerical expression in the source sentence should have a corresponding expression in the target sentence. Omissions: when the length of the source sentence differs substantially from the lenght of the target sentence, TransCheck flags it. We do not wish to suggest that TransCheck could be used to verify any and all types of translation errors. Subtle errors of meaning, for example, where the target sentence does not precisely convey the intended sense of the source text, are not amenable to the mechanical kinds of verifications that are described above. On the other hand, TransCheck is an open-ended system; as our understanding and ability to formalize translational equivalence evolves, new kinds of verifications could certainly be added to the system.